Anyway, I of course wanted to share it with all of you in hopes it can be of use to some of you with your goals as well (click on the file name below to download it… it’s in PDF form). You can use stickers to mark off each chapter completed, or let your little ones color in each circle… whatever floats your boat. And hopefully this will help keep our kiddos motivated to sit still a little longer. 🙂 Enjoy! Important Papers Project: Grand Finale! Would you be ok with me sharing this with my young women for church? I am starting a goal for this with them soon and this would be perfect. I don’t want to use it en masse unless you are cool with that. And I am totally going to use it for our family. A little incentive to help my kids focus more is very helpful. Hey AJ- That is totally fine! It’s here to be used! After the crazy amount of time I spent making it (why do I DO that to myself??) it would make me happy to know it is being well used. 🙂 Thanks for asking first. Love it! I am printing it out now! thank you this is wonderful, I was here to ask if I could share it at church and saw your response above so will do so with thanks! Thank you so much! Our stake president issued the same challenge yesterday. We are getting started today and this will help out a lot! Thanks for sharing! 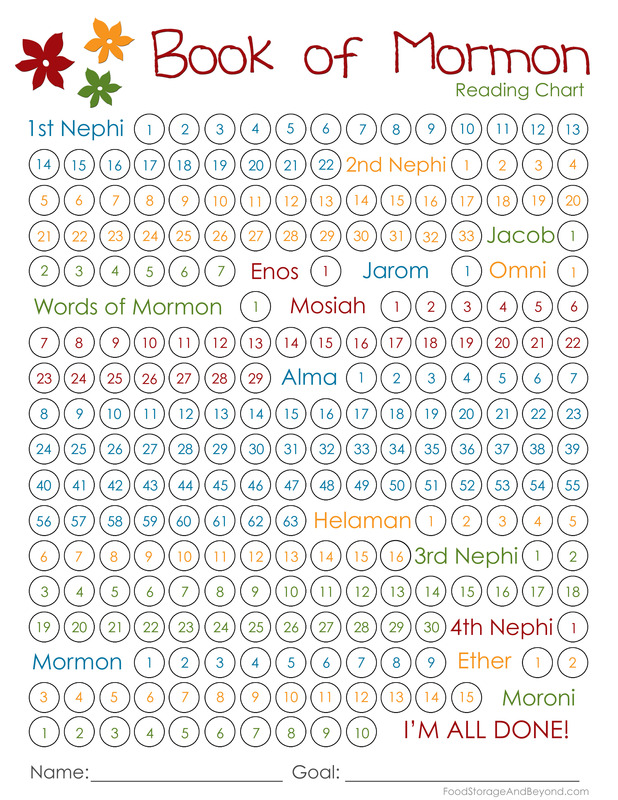 Thanks for posting this, I am the YW president in my ward and plan on using this to help them with the Book of Mormon reading challenge I am going to issue them at New Biginnings in a week. You did an AWESOME job on it, it is the exact kind I was hoping to find, and because of your hard work I you saved me from having to design and make one of my own. Thanks Becky! 🙂 Glad you like it. Thanks! I love your version! I loved the inspiration but really preferred a smaller printable version, so thanks for sharing with us!!! Well done!! WHAT??! How did that happen?! Good spotting, Kat. 🙂 Thanks for bringing that to my attention. I will work on fixing that. Love this chart. Just what the family was looking for! Thank you for sharing this! I am half way through and I think this will be the help I need to push along to the finish! This is great! Thanks for creating and sharing it! Beautiful! Thank you so much– this is the best one I have ever seen! Thank you so much for sharing. My oldest was 16 when we were issued a similar challenge and that was the impetus we needed to finally get into the habit of reading together every night. Thank you for creating this and being willing to share your work! My newly baptized son who is in love with charts has set a goal to read the Book of Mormon and this is the perfect thing for him! Both of my kids picked this one out of a slew I gave them to choose from. Thank you, thank you! This will be put to good use. I love this reading chart!! Thankyou so much!! will you make reading charts like it for the Old and New Testaments and Doctrine and Covenants?? I just found this chart on Pinterest. It makes my life a little easier. Thank you Debbie! Do you have charts for the rest of the scriptures? I am starting the New Testament, It would be great to have a Reading Chart for my class! I love this chart. My grandsons 12 & 8 just got Baptized and this will be awesome for them to help them keep track of their reading. I am wondering, as this is so cute, if you happen to have one for the other books of scripture.. It would be a great thing to do with them and them with their Dad. I’m printing one for each of my activity day girls. I don’t have the money to drop on this sort of think either (neither does my ward) and lack the creativity to figure out how to make one myself! Thank you so much!! Hi Debbie, I want to make this a poster for my family in my living room. I took it to kinkos To make it bigger, but I was told I need permission from you to do so. Is that something I can do? Hello! It’s been a while since your original post, but as we are trying to do a Book of Mormon challenge as a ward we are so grateful for bloggers like you who provide these kinds of items for us free of charge! Thank you for all of your hard work! Thank you so much for sharing this! I’m a checklist/visual person and this will be super helpful for me with the Prophet’s recent challenge. Thanks so much.